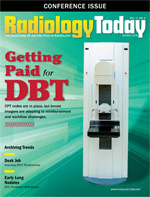 The DICOM Radiation Dose Structured Report (RDSR) is a tool that can help track radiation dose, but many radiologists do not realize what types of information they can and cannot capture with RDSR, according to an article in the July issue of the Journal of the American College of Radiology. Ioannis Sechopoulos, PhD, DABR, an associate professor of radiology and imaging sciences, hematology, and medical oncology at the Emory University School of Medicine and one of the article’s coauthors, says most people think of DICOM as just an imaging standard, but it can do more than that. DICOM can also save information about how a particular study was produced. Increasing attention has been paid to tracking radiation dose in the past few years, but those data need to be stored in a standardized way so they can be analyzed. Prior to RDSR’s release in 2005, there was no standard way to separate radiation exposure data from the image data. Accessing and storing dose data also required a lot of storage space because the information was attached to the images. If an image was duplicated, the exposure data were duplicated, too, which could result in overestimates of radiation dose. Also, if an image was rejected, due to technical issues or patient motion, or not recorded, such as fluoroscopic images or a scout image for mammography, those radiation exposures were not saved. RDSR addressed those shortcomings. Since its release, RDSR has become part of the DICOM standard for certain imaging modalities: X-ray angiography, CT, CR, DR, mammography, and nuclear medicine. It captures all data related to X-ray output that affect radiation dose, such as tube voltage, tube current, exposure time, and tube filtration. It also captures parameters that are either set by the modality or based on estimates from measurements, such as CT dose index (CTDI), dose length product, and average glandular dose. But RDSR has its limits. It does not record patient-specific dose. CTDI and other parameters are based on measurements from standard-sized phantoms. They record the radiation emitted by the modality but not the radiation that’s absorbed by the patient, and they don’t reflect variations between patients, such as differences in size, body composition, and position during the exam. “The same exam with the same CTDI on a very small patient vs a very large patient results in very different dose levels to the patients and their organs,” Sechopoulos says. For this reason, the Working Group 28 (Physics) of the DICOM Standard Committee is working on a new information object definition called Patient RDSR (P-RDSR). P-RDSR will archive estimates of the radiation dose that a patient’s organ or entire body receives, based on information related to patient size and positioning, as well as archival data of the methodology that a medical physicist used to estimate the dose. Sechopoulos says potential uses include improving the accuracy and utility of data that are submitted to national dose registries and providing data for large, retrospective studies that measure the effectiveness of different imaging protocols or shielding techniques. P-RDSR is being developed with input from the ACR, the American Association of Physicists in Medicine, the European Federation of Organisations for Medical Physics, and the European Society of Radiology, as well as suggestions from vendors. It will be submitted for approval next year, and if it’s approved, Sechopoulos estimates that it will take three to five years to be integrated with vendor offerings. He believes the standard is not only feasible but also highly beneficial for radiology practice, and he sees a lot of potential uses. — David Yeager is a freelance writer based in Royersford, Pennsylvania. He writes primarily about informatics topics for Radiology Today.